The Randger Campervan R535 is a great model and priced from £43,995 The Randger Campervan R535 is French built in a purpose built factory. 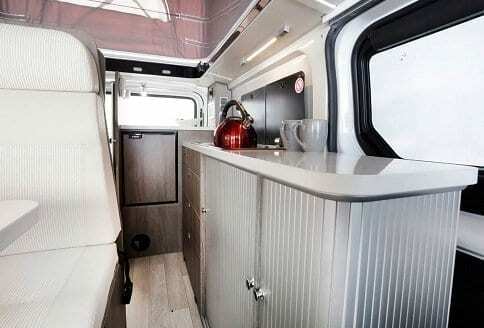 Owned by the Trigano Group the Randger Campervan R535 has a very good specification. With designated passenger seats for 4 and berths (sleeping positions) for 4as well. The dimensions; Overall length 5.4 m. Overall width (mirrors folded) 1.96 m. Overall height (exc tv aerial) 2.03 m. The weights comprise of MTPLM 3010 kg. Mass in running order 2429 kg. Maximum user payload 581 kg. Maximum trailer weight 2000 kg. Gross train weight 5010 kg. 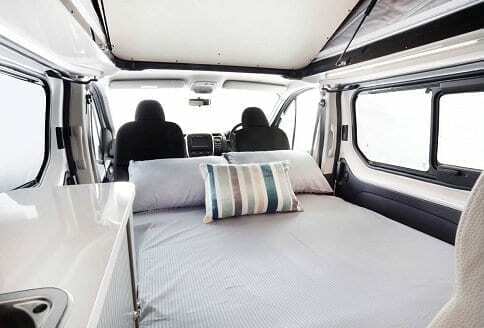 Bed sizes on the Randger Campervan 5535 are a roof bed 1998 mm x 1210 mm and lower bed 1840 mm x 1328 mm. The Randger has ample power delivered from the Ecojet (125 Hp) this uses the mixture preparation/injection method, With a common rail with fixed geometry twin turbo. It has 4 cylinders and a cubic capacity of 1598 cc. Standard is the 6-speed manual gearbox. It has an 80 litre fuel tank. With EU exhaust emission standard Euro 6 emission control and a SCR catalizator. This also uses the Adblue injection with particulate filter (DPF). 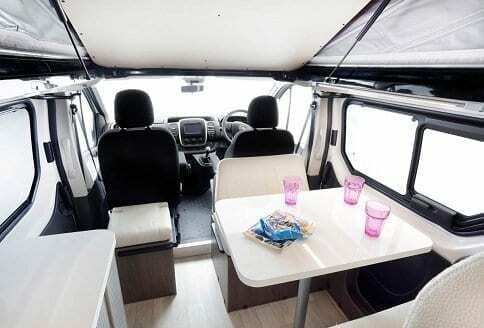 The Ranger Campervan R535 has some great features. 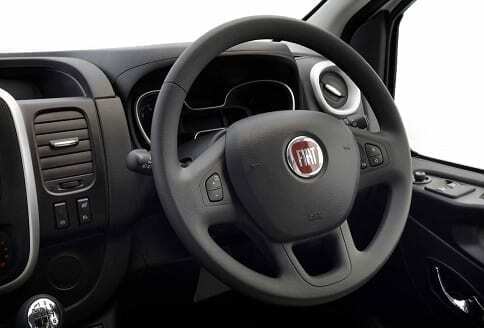 Driver and passenger airbags, cruise control, cab air conditioning, ABS with EBD and HBA, ESC with TRACTION+, remote central locking of cab doors and immobiliser. With a fully upholstered swivel captain chairs, with two armrests and height adjustment. Other safety equipment includes a CO2 Alarm and Smoke Alarm with three point seat belts to all designated passenger seats. In addition it has very handy front seat covers. Now for making sure there is plenty of power available. The Randger Campervan R535 has a 1x USB charging port, 1x 240v socket and 1x 12v socket. There is a mains consumer unit with mains isolator and a 12v fuse board. This also has a large, easy to read, 12v control panel near to the entrance door with a charger. To keep a good room temperature there is a Webasto Air-Top 2000 diesel air heater. Water comes via a pressurized fresh water pump. On a safety note there is isolation taps for gas appliances. With an excellent leisure battery on hand to keep things going. With a 55 litre fresh water tank and an ample 43 litre waste water tank. A safe and easy to find gas bottle compartment. This comes with storage of 1 x Campingaz 907 (2.75kg). 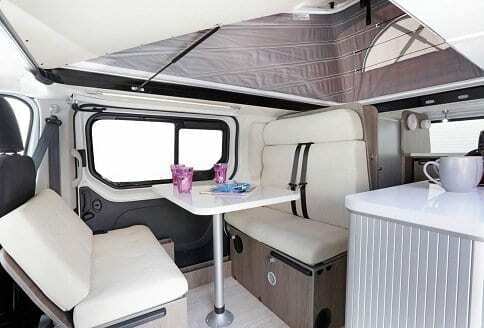 The Randger Campervan R535 comes finished with high impact polymer coated interior walls. With interior ‘Mole’ furniture. Insulated and very stylish interior curtains. With car style comfortable everyday rear passenger seats for 2 people. An easy to use elevating canvas roof with spacious child’s double bed sleeping. Also, for their size we have spacious wardrobe and lockers. All neatly finished with secure chrome positive catches on all furniture doors. It also comes with a very handy removable dinette table. The kitchen has a 2 burner gas hob with piezo ignition. Nicely appointed stainless steel kitchen sink with extendable kitchen work surface. The other key thing is the 41 litre Webasto Isotherm fridge.